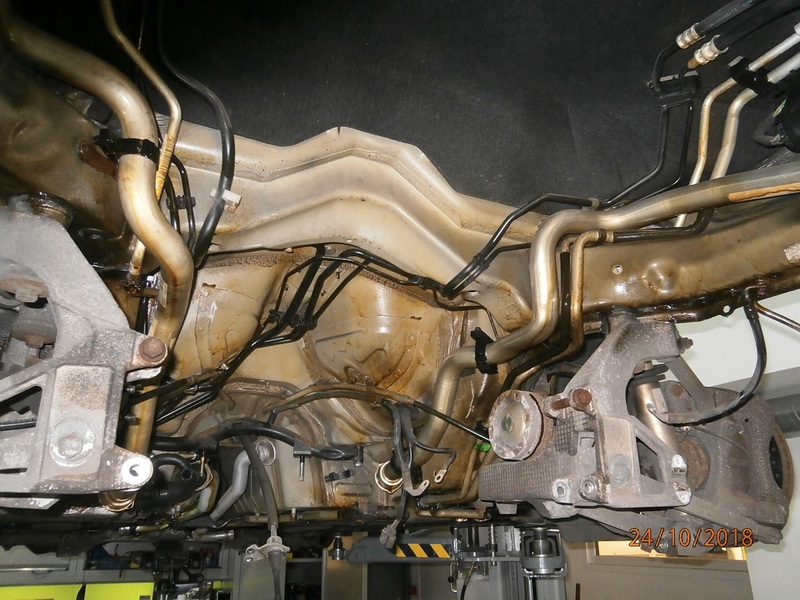 911uk.com - Porsche Forum : View topic - Corrosion issues to pipes , mentioning again. 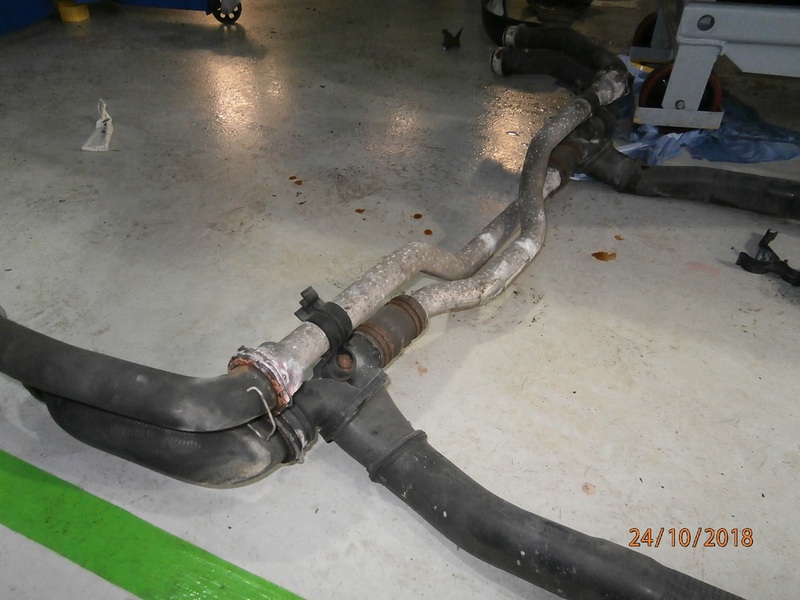 911uk.com Forum Index > 997 (2004 - 2012) > Corrosion issues to pipes , mentioning again. Posted: Mon Oct 22, 2018 7:39 pm Post subject: Corrosion issues to pipes , mentioning again. Car in for a temp gauge failure .. its a tip , turned out to be the electric valve on the tip box that had failed .. over cooling basically . 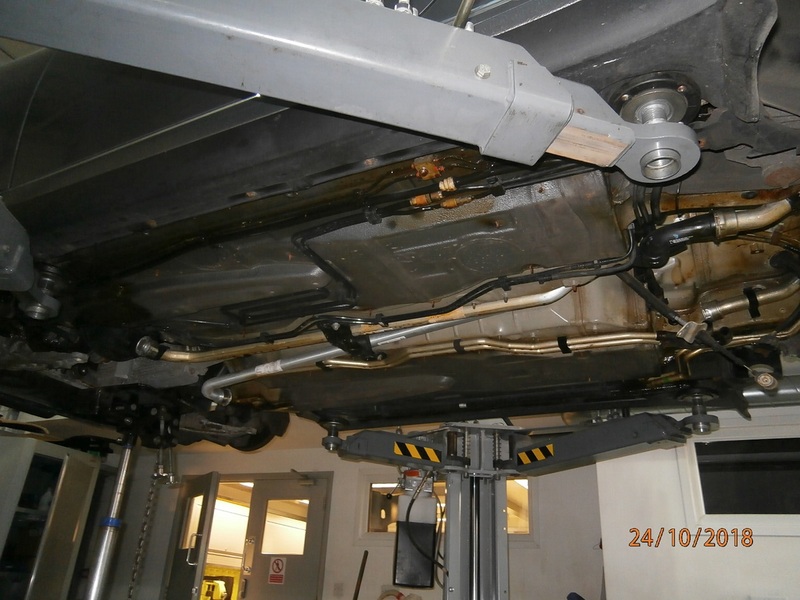 Whilst on the ramp i saw coolant dripping out from the center part of the undertrays so removed and inspected . Pipes in the center had rotted through in the brackets , had a look at the crossover pipes and they were heavily corroded and damp. Started to replace these items .. rear pipes were also corroded , unable to save pipes over engine so im now dropping the engine / tip box ( more expensive ) to replace almost every coolant pipe. Not a drop of acf 50 or waxoil on the car .. even the brake pipes are corrodeing badly ... ill not mention the chassis rust ! Moral is .. if they havent been coated in something then please get it done .. i dont care if its waxoil , acf 50 or even bitumen .. get it done or you will end up with a very large bill like this poor guy . Public service Message ends . My winter project is to remove under trays to clean and Dinitrol my 997 as I did the sills this year when I fitted new GTS sill trims. Who can do this sort of work (and properly)? Around London! Im way to far south to be of use but i do tend to recomend 9 Exceillence as its the only garage ive had dealings with close to london . I find this all very frustrating.... mine went in for a major last week and I asked them to look under the trays and apply some waxoyl to all the weak points. They just weren't interested - trays provide all the protection you need etc. Can anyone recommend someone in the East Midlands to do this job for me? Demort - how much would this cost (approx.)? As a stand alone job i would guess at 1 hours labour charge .. that would include the " waxoil or what ever ". A lot of indys do this reguardless on a major service ... but i am talking about spray what ever you can sort of job and not just a few pipes , so this would involve removeing all undertrays . All i can say is .. its well worth it as im guessing the job im doing is £4 - 5k to replace pipes .. and im waxoiling them along with tip pipes , brake pipes chassis etc etc . How solid a car is depends on where it lives .. im near the coast so these suffer badly .. but any car as it gets older will suffer .. all i can say is i havent done total coolant pipe replacements just once .. a/c .. brake pipes .. they all suffer in the end and its not a huge expense to try and prevent it .. hence this post . Although I don't take mine out in the wet, I will now to this in order to future proof! I do wonder how long AC50 lasts. It looks amazing when it goes on, so that's good. I've covered everything on mine in the stuff, so I'll keep an eye on how well it lasts as it's a new product to me. Some time ago, I read comparisons between various treatments like Waxoil, inc one guy who built Concours-quality cars did his own tests with salt water trays.. and the stuff from bilthamber always came out on top. This might be a silly question, but do you need to do anything to remove any salt etc that has accumulated prior to waxoiling (or whatever), or do you just apply it? I would do as much as you can to clean before applying anything. Like paint, it wont stick very well to dust or salt. On top of that, you don't really want to seal that salt in either. Can any of you kind souls point me in the direction of sourcing replacement plastic hex nut which hold the undertrays on? once i have some of these- its out with the waxoyl and up on the ramps. That makes for sobering reading. 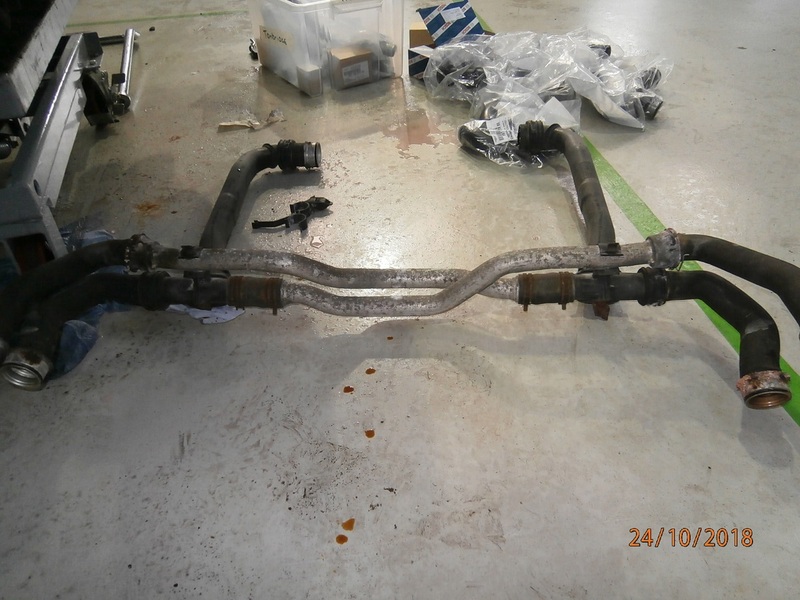 And I can only confirm that the pipes on some cars can be a very weak point, having seen several that were very long gone on a few PPIs done over the last year. Even the cars I've looked at that have lived life away from the sea seemed to be afflicted, especially if not garaged and sitting out on the street. I know what the first thing is that I'll be doing once I get another one. A few picts to show you what the cross over pipes look like and where i emptyed my first of 2 cans of waxoil . You can see the pipes that require the engine out. Yep - recognise the pipes from the last pic as I’ve just had mine done. Not a cheap fix but the news ones are now treated as recommended. Yeah one of those was leaking on mine through corrosion, it was picked up on the PPI I had at an OPC so the dealer had them replace both, engine out so not cheap! Any tips for the Waxoyl application? aerosol, pump or brush it on? Don't suppose it matter as long as it goes on. Wont it melt off the hot pipes? We use a spray can .. not sure the type .. i thought there was only one but i guess not . It wont melt .. it will smell for a while if you do what i have though .. i buryed the car in it but that was over kill for a normal car .. there was a lot of chassis rust on this one so you wouldn,t normally use as much as i have . You dont have to use this .. ACF50 is recommended by many people here ..
All i would say is use something and a spray can is easier .